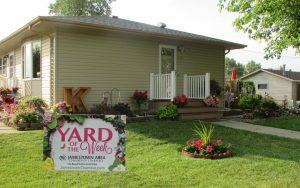 Chamber Release – The Jamestown Chamber Beautification Committee is pleased to announce the weekly winner of the Yard of the Week Program for 2018. Daniel and Susan Koropatnicki of 1311 16th Street SW in Jamestown, have received this award for Week Five. They have put a lot of effort into their beautiful yard. Drive by and stop to congratulate them and thank them for their efforts to help beautify Jamestown. Congratulations, Daniel and Susan for a job well done! The Yard of the Week program has been established to recognize those within the community that take pride in the appearance of their yard and do their part to beautify the community. The program began June 1st and ends August 31st. Yards will be selected each week from nominations received. Nominated yards must be visible from the street. To nominate a yard for the Yard of the Week program, please contact the Chamber at 701-252-4830 or stop by our office at 120 2nd Street SE, Jamestown for a nomination form. The completed forms require a valid phone number so we can contact the perspective winner. Forms are also available on our Facebook page or on our website at www.jamestownchamber.com. Forms can be emailed to director@jamestownchamber.com. All single family residences within Jamestown are eligible for the program.